Is there a sweeter sound than a putt rattling home? And the farther away it is, the sweeter it sounds. 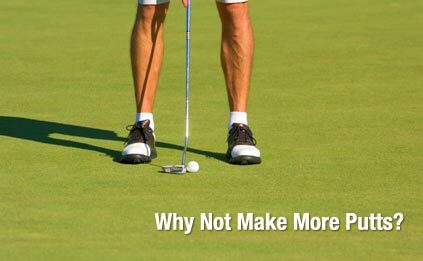 With training from GreenToTee, you’ll putt more consistently, more accurately, and less often! What if you could eliminate three-putts (or worse) from your round? How many strokes would you save? Five? Ten? More? At GreenToTee we use the advanced technology of the Science and Motion's SAM PuttLab to help you learn to putt like the pros. Putting instructional specialists use SAM Putt Lab to see things not possible even with the eyes of an expert. SAM PuttLab uses ultrasound to analyze the 28 (yes, 28!) most important parameters of your putting stroke, and displays the findings in easy-to-read graphics. The results of each stroke are immediately displayed, giving you the instant feedback so critical to learning skilled movements. You’ll see your motions compared to Tour Pros, and all of your results can be converted to PDF files for instant e-mailing to your home computer.